ALLEN PARK — Lions coach Jim Caldwell talked with Ndamukong Suh about stepping on Packers quarterback Aaron Rodgers, but would not reveal the content of the conversation. Suh stepped on Rodgers’ left leg twice — once with his right foot, then his left foot — late in Sunday’s 30-20 loss to the Packers. Suh did not talk to the media following the game. Caldwell wouldn’t share his thoughts on the matter. “Personal views don’t matter in this particular case. ... Obviously one of those situations that they’ll have to rule on,’’ Caldwell said. The previous week Caldwell had talked to Dominic Raiola about stepping on Chicago’s Ego Ferguson. Caldwell said he believed Raiola that it was inadvertent but could see both sides. Raiola was suspended for Sunday’s game. 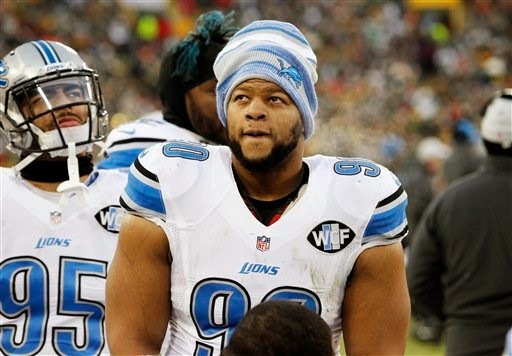 Suh faces a possible suspension or a heavy fine. He’s previously been fined eight times by the NFL and served a two-game suspension in 2011 for stomping on Green Bay’s Evan Dietrich-Smith.